JUMP has added a new charging station at 8th St and P St, called ‘Capital Athletic Club Charging’. The charging hub is under the overhang to the right (south) of the entrance, NOT the traditional wave racks at the entrance. There are nine charging docks, three groups of three, at this location. This is the second charging hub in Sacramento, joining the one at Sac City College, near the light rail station entrance. This location was not a drop zone, so it represents an additional hub in a part of downtown that did not have a drop zone. 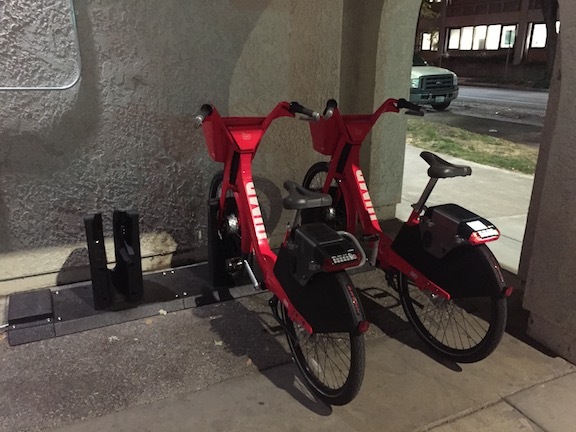 By the way, JUMP bikes had disappeared from the Transit app for about a week, but they are back. Apparently JUMP changed some things about how the data feed works, and it broke other apps that rely upon the JUMP feed.